P1057. 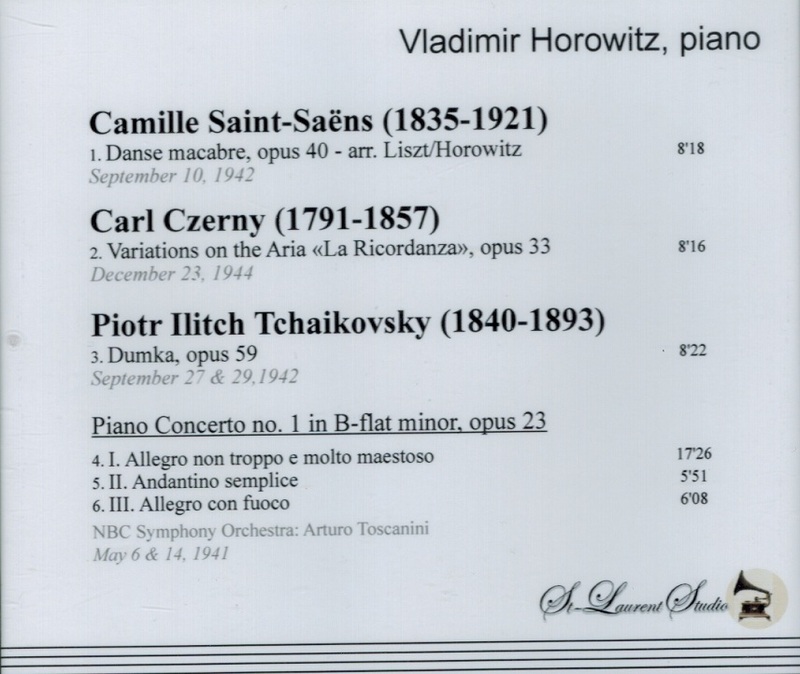 VLADIMIR HOROWITZ: Saint-Saëns, Czerny & Rachmaninoff Recital; w.Toscanini Cond.NBC S.O. : Concerto #1 in b-flat (Tschaikowsky). (Canada) St Laurent Studio YSL 78-195, recorded 1941-44. Transfers by Yves St Laurent. “Held in awe by aficionados of the instrument, Vladimir Horowitz virtually cornered the market on celebrity among 20th-century pianists. His presence hovered over several generations of pianists who followed him. 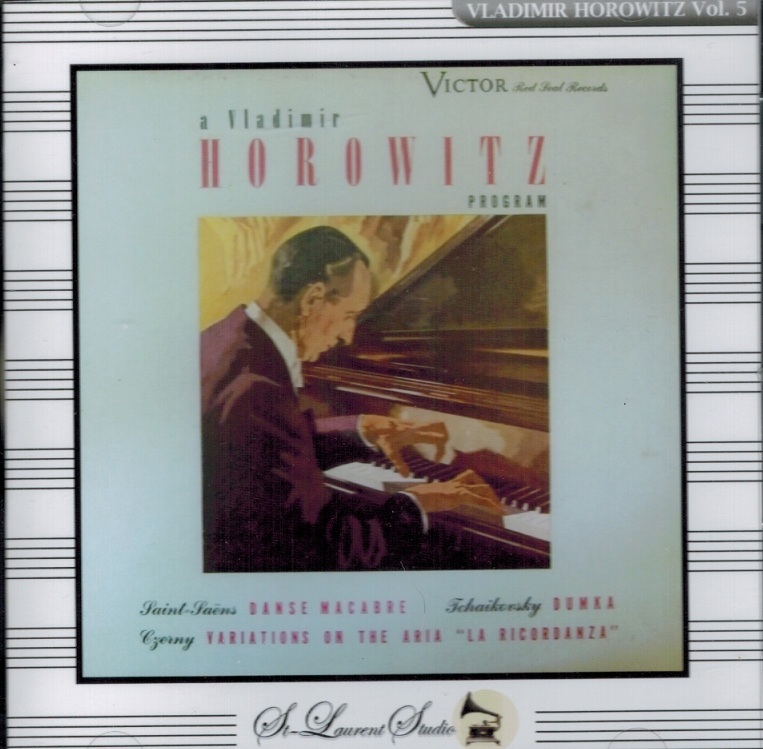 Harold C. Schonberg, long the senior music critic for The New York Times and the author of THE GREAT PIANISTS, wrote: ‘As a technician, Horowitz was one of the most honest in the history of modern pianism. He achieved his dazzling effects by fingers alone, using the pedal sparingly. Notes of scales could not be more evenly matched (his Scarlatti was technically fabulous); chords could not be attacked more precisely; octaves could not be sharper or more exciting; leaps could not be hit more accurately. No matter how difficult and complicated the piece, Horowitz would make it sound easy. And above all there were his stupendous fortissimos - that orchestral body of tone that only Horowitz could produce’. Of himself, Mr. Horowitz once said, ‘The most important thing is to transform the piano from a percussive instrument into a singing instrument . . . a singing tone is made up of shadows and colors and contrast. The secret lies mainly in contrasts’. Into Mr. Horowitz's late 70's and early 80's - when he made a heavily publicized and carefully orchestrated comeback in the concert world - he retained the ability to extract colors of either extraordinary brilliance or extraordinary delicacy. In his concert appearances during the 1920's and 30's, Mr. Horowitz's ability to create excitement in whatever he did on stage made him an almost mythical figure - a status only enlarged by his personal eccentricities and flair for attracting public attention. Even his frequent retirements from performing had a romantic appeal to mass audiences. A man known for the frailty of his nerves, Mr. Horowitz quit playing in public four times - between 1936 and 1938, from 1953 to 1965, from 1968 to 1974 and from 1983 to 1985. This seemed only to sharpen his public's appetite. When Mr. Horowitz did play, he drove a hard bargain: his personal piano from his Manhattan living room accompanied him; concerts were at 4 P.M. and only on Sunday. Advance teams redecorated his hotel rooms to make him feel less estranged from the comfort of home; his own food was cooked to his taste. Mr. Horowitz's last withdrawal from concert life came after a series of uneven performances in the early 1980's - ones which he subsequently blamed on overmedication. But in the last four years of his life, he became virtually a one-man industry in the concert business - with a much-publicized tour of the Soviet Union, performances in Europe and America, all linked with compact disk recordings, videotapes, television programs and films. His return to Moscow and Leningrad in 1986, after a 61-year absence, became a major media event reported around the world. The Bolshevik Revolution in 1917 pushed Mr. Horowitz onto the concert stage. In the political upheaval, his family members lost most of their possessions, and Mr. Horowitz began playing piano recitals to earn money, food and clothing for them. He performed 15 times in Kharkov during the 1922-23 season with great success and subsequently went out on a 70-concert tour (playing 200 different works). In 1925, Mr. Horowitz induced the Soviet authorities to allow him a student's visa for foreign travel, but on arrival in Western Europe, he ignored schools and plunged instead into a two-year tour of Europe. Audiences loved him and critics compared him to Anton Rubinstein and Busoni. Mr. Horowitz was brought to America by Arthur Judson, the all-powerful impresario of the era. 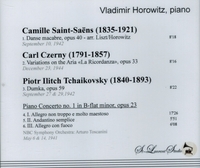 Early in 1928, Mr. Horowitz played the Tchaikovsky First with the New York Philharmonic under Sir Thomas Beecham. Olin Downes, then a critic for The New York Times, described his reception as ‘the wildest welcome a pianist has received in many seasons in New York’. The performance, wrote Downes, was ‘a whirlwind of virtuoso interpretation, amazing technique, irresistible youth, electrifying temperament’. The first of his several withdrawals from the concert stage was engendered by the 1935 season, in which Mr. Horowitz played nearly 100 recitals. Immensely fatigued, he had a particularly slow recovery from an appendectomy. For the next two years, he lived in France and Switzerland, where he studied alone. He began to play again in 1938, first in Zürich, then in Paris. In 1940 he returned to the United States and renewed his American career with a recital at Carnegie Hall. In 1942, he was the highest paid concert artist in the country. Two years later, he was awarded American citizenship. During World War II, the pianist appeared with Arturo Toscanini in many war-bond concerts, and in 1945 he fashioned his celebrated transcription of Sousa's ‘Stars and Stripes Forever’ for a patriotic rally in Central Park. After the war, he continued an active career, recording and giving concerts throughout the world. In 1953, he celebrated the 25th anniversary of his American début with a concert at Carnegie Hall, later recorded and issued on a two-record RCA Victor set. Then he went into a retirement that lasted 12 years. Although several recordings were issued during this period, including some of the pianist's best, he was tantalizingly inaccessible to the public, and the Horowitz mystique grew. Mr. Horowitz never did much teaching and, by all accounts, was not particularly adept. His best-known pupils were Byron Janis, Gary Graffman and Ronald Turini; Mr. Turini was said to be his favorite. Other students included Alexander Fiorillo, Coleman Blumfield and Ivan Davis. Mr. Horowitz's last appearances as a performer were in the spring of 1987 when he played in West Berlin, Amsterdam and Hamburg. His last American concerts were in the fall of 1986 when he played at Lincoln Center and helped celebrate the reopening of a refurbished Carnegie Hall. Isaac Stern reflected on Mr. Horowitz's extraordinary career: ’How many musicians can say that they have created a standard against which others will be judged? It was not only the personality that was extraordinary, but his pianistic and musical accomplishments, against which piano playing in the future will be measured. His concert performances were extraordinary. One I recall in particular was his return to Carnegie Hall. In the Chopin 'Black Key' Etude, the way he threw his hands at the octave passages at the end drew a giant gasp from the audience, which was filled with musicians. And when you saw him playing close up, it was as if each of his 10 fingers had a separate intelligence. Each moved in its direction at the right time and with the right weight; and he sat apart, observing it and controlling it from a central organism, without great effort. He will be regarded as part of the pantheon of musicians who influenced their times, and who left a special legacy that will be remembered and thought about by anyone who cares about performance’." “Vladimir Horowitz is recognized as the greatest piano virtuoso of the twentieth century. Possessor of staggering technique, he was, in his prime, probably unequaled for speed and dynamic range, and he remains unequaled in his ability to evoke the Romantic tradition of highly expressive, personalized pianism as practiced by such legendary musicians as Franz Liszt and Sergei Rachmaninoff. As Time Magazine's Michael Walsh noted in a 1986 report, ‘At his peak, Horowitz had it all, heightened and amplified by a daredevil recklessness that infused every performance with an exhilarating, unabashed theatricality’. Walsh proceeded to refer to Horowitz as ‘this most extraordinary of artists’."